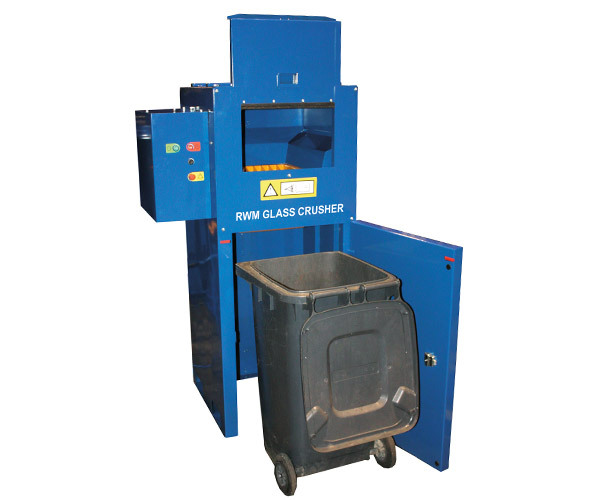 An easy-to-operate crusher, helping businesses to improve the UK’s glass recycling rates. Suitable for large or small glass-handling companies, this compact machine is popular with hotels, restaurants, pubs and recycling centres alike. Glass – in a wide variety of bottle sizes. The primary goal of the RWM Glass Crusher is volume reduction. And with a compaction ratio of 5:1, from bottles to cullet, our clients can reduce the frequency of their glass collections and achieve cost savings of up to 80%! The machine is compatible with both 140 and 240 litre wheelie bins. By visiting the dedicated RWM Glass Crusher page or by contacting us directly. People are welcome to call us on 01423 325038 for an informal chat or they can email sales@wastemachinery.co.uk. Look out for our next baler of the month feature in November (we promise it will be an actual baler!) or follow us on Twitter for our latest news updates and offers.